In 1991, ZAP, or Zinfandel Advocates and Producers, joined with scientists at UC Davis to determine the origins of the Zinfandel grape and to develop high-quality clonal material for future vineyards. Professor Carole Meredith of UC Davis used DNA technology and worked with researchers in Italy and Croatia to discover the grape’s true origins. She verified that a Crljenak Kaštelanski vine discovered in Croatia by scientists at the University of Zagreb was genetically identical to Zinfandel. Every year Ravenswood staff produces a T-shirt to mark the annual harvest. 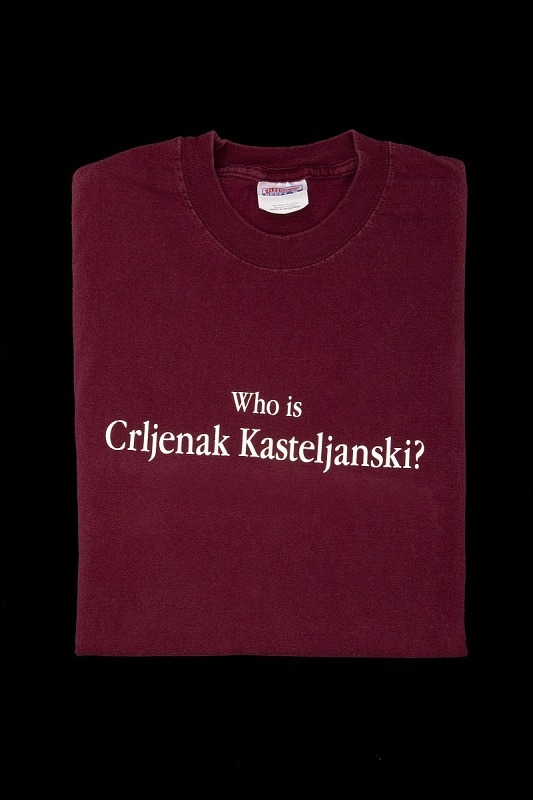 The answer to the question posed on the shirt is not a “who” but a “what.” Crljenak is the Croatian grape genetically identical to Zinfandel, Ravenswood’s prime grape and production varietal. Gift of Joel Peterson. Scientist Ann C. Noble developed the original aroma and taste wheels for winemakers and growers. This wheel is specific to Zinfandel and aims to increase consumer knowledge among the many new fans of Zin.